As of 1 June 2009, Subi Sebastian has been appointed Easternpak Commercial Supervisor. In 2000, Subi joined Easternpak as Sales Coordinator and then became the Executive Secretary of the Financial and Administration Manager in 2001. He then assisted in export sales support in addition to his administrative responsibility and remarkable results were evidence in both responsibilities. Early 2007, Subi joined the commercial department as Commercial Officer handling all local purchasing along with raw material logistics. In his new responsibility, Subi will be in charge of company purchases, savings, sourcing new suppliers and coordinating all import logistics. Leading by example, positive attitude and professionalism has led Subi through a successful career and we wish him another success in his new endeavor. As of 1 June 2009, Rabih Mohammad Said has been appointed Sales Supervisor of Easternpak, corrugated packaging manufacturer in Dammam, Saudi Arabia. In December 2004, Rabih joined Easternpak as Sales Representative. From 2008, he handled sales in Bahrain where he expanded the company's market share. His outstanding results and sales performance earned him new challenging responsibilities. Rabih will achieve greater results in his new endeavor and will bring new sales dimensions to the sales team and excel in protecting and increasing our market share in home market. Please join us in wishing Rabih success in his new responsibilities. PE film manufacturer aims to help support the purchase of wheelchairs for 100 physically disabled citizens in Lebanon. Zouk-based MASTERPAK calls on members of INDEVCO Group in Lebanon to help collect plastic caps for Arcenciel. The non-profit organization will purchase one wheelchair for every 500,000 plastic caps collected, the rough equivalent of one ton of plastic, which will be recycled. The goal is to accumulate enough caps to buy 100 wheelchairs. Arcenciel administers 7 programs in 10 centers across Lebanon: rehabilitation, employment, social, youth, health, environment and agriculture. Brand Protection Group Lebanon will hold its General Assembly meeting at INDEVCO Group in June. INDEVCO Group will host the General Assembly meeting of Brand Protection Group Lebanon at INDEVCO headquarters in Ajaltoun, Lebanon on Thursday, 18 June 2009. 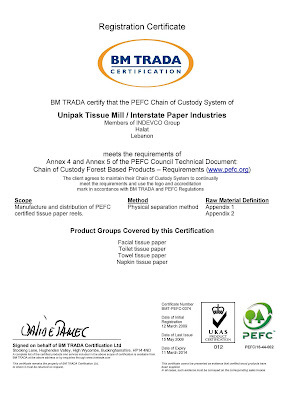 Brand Protection Group, an association of leading local, regional, and international manufacturers and distributors, joined efforts in March 2003 to fight counterfeit products in Lebanon and the Levant region. Facilitators include experts from the U.S. Patent & Trademark Office (USPTO), U.S. Customs & Border Protection , Lebanese Customs experts, and BPG members from the private sector. With the support of the Institute of Finance, BPG member companies will share counterfeiting issues related to their brands in Lebanon and how to identify counterfeits from originals to around 350 on-the-ground government inspectors and lab technicians. Participating governmental inspection bodies concerned with IPR include Lebanese Customs, Lebanese Ministry of Trade & Economy, Lebanese Internal Security Forces, the standard organization LIBNOR and technical labs IRI and Fanar. With offices in Lebanon, Jordan, Syria, Egypt and Yemen, BPG has launched media campaigns and cooperated closely with local governments to stop the spread of the counterfeit industry and to protect consumer rights in society. Unipak Nile exhibits at the annual packaging and printing tradeshow in Egypt. Unipak Nile Ltd, Egyptian corrugated manufacturer in 6th of October City, participated in the third annual Techno Print Egypt 2009 in Cairo International Conference Center from 23 - 28 May 2009. Techno Print is one of the largest packaging, printing and publishing exhibitions in Egypt and the Middle East. International printing, packaging manufacturers and suppliers exhibited, as well as participants from various sectors, such as graphic arts and publishing industries prepress houses, offset, flexographic, gravure and digital printing companies participated in the exhibition. Techno Print Egypt exhibition was inaugurated by Egyptian Minister of Manpower & Migration, Aisha Abdel-Hadi. Unipak Nile showcased its wide range of corrugated cartons, boxes, trays, and point-of-purchase (POP) displays to visitors for the agricultural and industrial sectors. Egypt represents a main gateway to the Middle East, Africa, Asia and Europe. Egypt has been in the printing industry for more than 70 years and has more than 8000 printing companies and manufacturers of printing materials. Unipak Nile also exhibited in Techno Print Egypt 2007 and Techno Print Sudan 2007. Unipak Nile manufactures virgin and recycled corrugated carton containers, serving the Egyptian market, North Africa, the United Kingdom, and Europe. Founded in 1996 by INDEVCO Group, the converter supplies high-quality corrugated regular slotted containers (RSC), die-cut boxes, and POS promotional displays to agricultural, catering, industrial and promotional sectors. INDEVCO Group is the sole licensee of OTOR packaging systems in the Middle East. 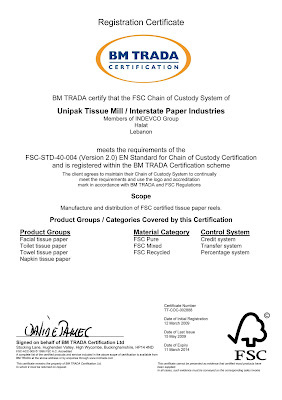 Our ISO 9001 & HACCP certified manufacturing plants produce over 100.000.000 sq.m/year of corrugated sheets ranging from standard post-print to the highest graphic levels of offset printing passing through cost-effective, high resolution pre-print and converted into packages using the latest technology in flat die-cutting. Sanita offers companies across Lebanon Sanita's new Shouf 7alak bi Lebnan facial tissue. As part of its integrated "Shouf 7alak bi Lebnan" or "شوف حالك بلبنان" campaign, Sanita, leading consumer disposables manufacturer in Lebanon, launched a special edition of facial tissue for the campaign and distributed it to companies across Lebanon in May 2009. This new edition features a duplex facial tissue box with a scene from the TV commercial and allows consumers to insert their own photo in the photo frame. The Shouf 7alak bi Lebnan campaign, which conveys inspiring patriotic meanings and sentiments for Lebanon, is running from 15 May till 7 June 2009 on national TV channels in Lebanon and it aired for the first time from 17 November till 4 December 2008 on national television and radio stations in Lebanon. The facial tissue box was conceptualized and executed in collaboration with Mediapak advertising and marketing agency, member of INDEVCO Group.